Have a Star Wars lover in your life? Check out this list of fun and unique gifts for every budget! I have to admit, I wasn’t much of a Star Wars fan when I was younger. It wasn’t until Avery started watching the movies that I got into them. He seemed to understand the plot lines even at a young age, and I was asking him to tell me what was happening! Now we enjoy watching the movies together. He is a huge Star Wars fan and was even Boba Fett for Halloween! Do you have a Star Wars fan too? 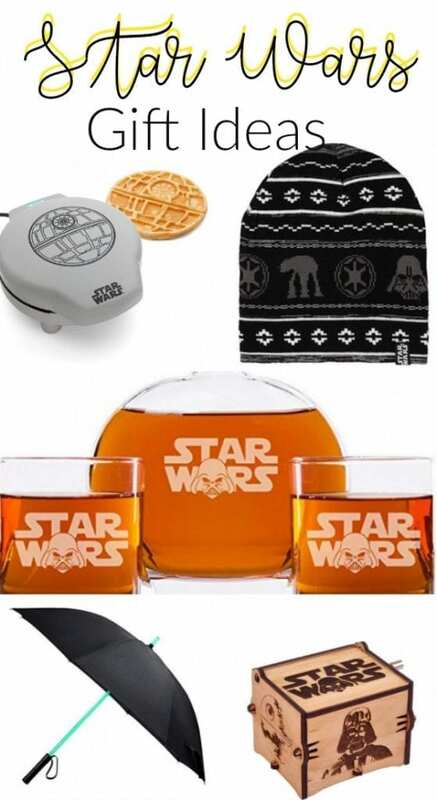 Check out these awesome gift ideas (for any budget) for your Star Wars fan. Han Solo’s Lucky Dice – these will look great hanging from the rear view mirror of any Star Wars fan! Light Up Death Star Beach Ball – the beach or pool will never be the same! This Death Star beach ball is super fun for a Star Wars pool party. Lightsaber Mug – hot liquid makes light sabers appear on this otherwise inconspicuous mug. This is great for a coffee loving Star Wars fan. Death Star Herb Garden – this is a unique gift for the cook who loves Star Wars. Star Wars Bop It – R2D2 looks just like any other toy but he’s really a fun game. This is great for tweens and teens. Wookie Cookies: Star Wars Cook Book – your recipient will learn how to make Star Wars specialties like Boba Fett-Uccine and Princess Leia Danish Dos in this fun cook book. Porg Mug – porgs may be the cutest little guys to hit the Star Wars movies in a few years. 3d Illusion Night Light: Death Star – this fun night light changes 7 colors and 3 Star Wars shapes. Star Wars Toaster – because who doesn’t want a little Star Wars at breakfast? Words of Wisdom T Shirt – Yoda offers some free words of wisdom on this fun tee shirt. Millenium Falcon Tie – make any fancy outfit fun with this super cool tie! 2 Quart Star Wars Slow Cooker – great for keeping dips warm at parties! At At Beanie – keep your favorite Star Wars fan’s head warm with this beanie. BB8 LED Light – 3D vision effect is awesome for kids rooms. LED Light Saber Umbrella – you’ll be wishing for rain with this fun umbrella. R2D2 Charging Station – let R2D2 charge your device with this cute charging station. Star Wars Multi Tool – 4 Hex Keys, 2 Screwdrivers, and an Adjustable Wrench make this tool useful for a handy Star Wars lover. Death Star Waffle Maker – pair this with the toaster above and the force will always be with you at breakfast. Boba Fett Apron Set – slay dinner like Boba Fett in this cute set. Star Wars Music Box – enjoy the Star Wars theme whenever you want! Jedi Challenges Augmented Reality Experience – light saber battles and more are part of this virtual reality! Cross X Star Wars Pen – a beautiful pen for someone who loves Star Wars but isn’t the tie type. Available in three iconic characters: Darth Vader, Stormtrooper, Millennium Falcon. 2 Hand Painted Glasses – gorgeous hand painted glasses are a great addition to the cupboards of any Star Wars lover. Engraved Decanter and Glasses – Exquisite bar ware perfect for the socialite Star Wars lover. Etched Pint Glasses – Another gorgeous Star Wars gift that would be loved by a beer lover.